You can’t find good people to work for you? Your new hire isn’t delivering on what you expected? You understood how your colleagues and employees perceive your strengths and struggles? Improve Hiring & Selection: The right person in the right job is priceless. The wrong one is a nightmare waiting to happen. Accurately identify job applicants BEFORE the interview, make scientifically informed judgements and build an organization of A+ employees. Increase Sales: Teach your sales team powerful behavior profiling skills. Empower them to identify – to your organization’s advantage – observable behaviors, then adapt their selling style to fit the customer’s buying style. Improve Customer Service: Know in advance that your people believe in your organization and care about your customers. Better equip and train your customer support team with the invaluable communication and behavior profiling skills that pay countless dividends. Increase Productivity: Identify with scientific accuracy the strengths and shortcomings of each employee. Create observable action plans, from the data, that maximizes your organization’s talent. Reduce Employee Turnover: Ensure the best possible positional job “fit” for each new hire. Great fit means stronger retention rates, which lowers the costs associated with turnover. Customize Employee Training: One size fits ONE, not all. Learn how each person learns best and get them back to productivity sooner. Model Team Building: Know who fits with whom in advance. Create your team based on compatible skills and traits, not just generic ideas of balance. Top-level teams are comprised of behaviorally compatible members with an optimal array of complimenting proficiencies. We’ve used our assessments with CEOs, executive teams, entire companies, schools, and more. Contact us today to learn more about how we can implement assessments in your business or organization. Most people know that the measure of a salesperson’s success is their ability to make new sales. However, how can a sales manager or organization predict a sales professional’s current skill level? Likewise, how can sales professionals see through the opaque lens of self-bias and identify their own areas of improvement, while finding the practical solutions for correcting them? 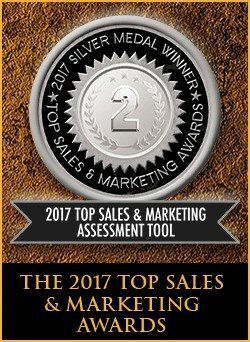 This award-winning sales skill assessment was jointly developed by best-selling authors Jeffrey Gitomer (The Sales Bible,) Jim Cathcart (Relationship Selling) and Dr. Tony Alessandra (The Platinum Rule for DISC Sales Mastery.) Borrowing upon the wisdom and experience of these three authorities, Sales IQ Plus measures a sales professional’s understanding of the strategies required to sell successfully in any environment. This assessment takes approximately 30 minutes to complete and consists of 48 questions that guide you in assessing each of the eight primary sales competencies, along with some vital selling traits. A sales "competency" is a category of selling proficiency that contains a number of different skills and knowledge components. All eight competencies combine to provide an overview of your current selling effectiveness. Preparing for the sale and preparing yourself. You can be well prepared with information and sales tools, but if you are not in the appropriate frame of mind, or if you do not appear professional to the buyer, you might not get the sale. Targeting explores the markets or groups you may target as prospective buyers. Then, we focus on the individuals with whom you will make contact. This includes the sales strategies and tactics you select for each target market. Poor targeting with great selling skills would result in limited success because you would be selling to the wrong people. Connecting is the initial sales contact step, where you must appeal to people intellectually so they will see you as a credible resource, and emotionally so that they will trust you as a person. Without either, you are inhibited from learning enough about them to solve their problems and make a sale. Solving the buyer’s problem, or filling their need, is where most of the sales attention has been placed in the past. This is the part where you present your solutions, tell your stories, demonstrate your product or describe the outcomes that buying will produce. At its lowest level, this is a sales pitch. At its highest level, this is a dialogue where you prove there is great value for them in buying from you. Confirming is the sales phase where you gain the prospect’s commitment to buy. Confirming is achieved only after you have shown the ability to solve the prospect’s problem. Historically, this has been known as “closing” the sale, but the truth is that it is not an end, but the beginning. It is at this point that the sales professional begins serving the customer and they, in turn, begin paying for the value they receive. Assuring clients that the value promised will be received is critical to customer retention. This is where relationships are built and customer loyalty is to be given (by you) more than expected (from them). Managing is the final phase of the sales cycle, where you manage sales and accounts and self-manage yourself. Ultimately, we are all our own ‘sales manager’. This is the phase of selling where you must make yourself do what needs to be done, even when you do not feel like doing it. By assessing your sales effectiveness in each of the eight areas, you will gain an overview that enables you to be a much more effective self-manager and consistently successful sales professional. Note: Each situation was developed and validated by sales professionals to reflect real sales strategies used by today’s sales force. Is there a Team Report for Sales IQ Plus? The Sales IQ Plus assessment is an objective analysis designed as a starting point — a type of ‘personalized map’ for your sales knowledge at this moment in time. It tells you where you are, why you are there and how to improve by offering specific insights and responses based on your assessment results. How often should the Sales IQ Plus assessment be taken? How can an upper-level sales leader or executive use Sales IQ Plus? How can a new or veteran sales professional independently benefit from the Sales IQ Plus? Exceptional leadership means constantly honing one’s skills, while investing in self-development. The Leadership 360° assessment provides today’s leaders an effective measurement tool from which they can objectively assess their current leadership strengths and areas for improvement— not just through their own eyes, but also through the eyes of their peers, managers and direct reports. This instrument is predicated on the research that identifies eight key competencies and/or abilities which set exceptional leaders apart from everyone else. If we can help today’s forward-thinking leaders identify where they measure up in these eight key areas, then we can equip them with the self-knowledge for personal and professional excellence. Communication Skills - The art of using words effectively to impart information or ideas in ways that resolve conflicts. Conducts constructive meetings. Expresses facts and ideas in an understandable and convincing manner. Listens well and considers other’s opinions before coming to conclusions. Does not interrupt others. Master of self-awareness and self-management in coping with stressful situations. Decision Making - The process by which one consciously selects of a course of action, among available alternatives, based on the best information available. Enacting decisions in a timely manner appropriate to the challenge at hand. Characteristics of good decision-making include influencing others through a wise course of action, carrying through on the course of action identified, and sound logic. Promotes Innovation and Change - To create a work environment that encourages creative thinking and justifiable risk-taking. Being open to change and new information. Adapting behavior and work methods in response to new information, tolerating ambiguity, changing conditions, or unexpected obstacles. Identifying opportunities to develop new products and services. Working Relationships - Creates an environment that encourages input and feedback by attentive listening. Positive responses and openness to alternative concepts by valuing diversity of ideas and cultural differences. Fostering an environment in which people can work together cooperatively and effectively in achieving organizational goals. Establishing and maintaining good working relationships with direct reports, peers, supervisor, and outsiders, as well as internal organizational units. Leadership Skills - Creates a vision or goal for one’s work unit and communicates it in a way that motivates others to implement it. Empowering people by sharing authority and delegating responsibility. Actively builds staff’s trust and commitment by mentoring, fostering good working relationships, and acting selflessly and with integrity. Coaching Skills - Seeks out the very best of "what is" in others to help ignite "what might be." Helps people clarify their career goals and actively develop skills needed to achieve those goals. Continually challenges people to improve performance, while providing frequent and helpful development discussions and feedback. Utilizes The Strengths of Others and Self - Efficiently focuses energy on developing and using the strengths of him/herself and others (versus a smaller portion of time trying to overcome shortfalls). Leaders still have to work on strengthening their shortfalls, particularly those that have a significant impact on productivity. Team Development - Demonstrates the ability to influence a group of diverse individuals, each with their own goals, needs, and perspectives, to work together effectively for the collective good. Insures that team members understand their roles and responsibilities, while encouraging mutual accountability for successes and failures. Works cooperatively with other parts of the organization by building trust, creating synergy, and recognizing successes. Are you an upper-level leader or executive? Immediately reassess the leadership qualities that brought you to your current position. Are you a supervisor or mid-level leader? Identify your current strengths and those areas where you need to improve. The Leadership 360° questionnaire only takes 10-15 minutes to complete, but can unearth a lifetime of professional benefits. It is both a catalyst and a road map for change. Invest a few minutes to discover how you can become an exceptional leader.